Sage BusinessWorks Accounting goes beyond "off-the-shelf" bookkeeping accounting packages by offering a wide range of features such as project management, inventory control, contact management, and more. Sage BusinessWorks Accounting provides the tools you need to manage your business more effectively today, allowing you to build a more profitable tomorrow. Combining robust features and high-level performance through 11 fully integrated modules and multiuser networking capabilities, Sage BusinessWorks gives you the power to run your growing business with maximum efficiency. It's so easy to learn that virtually anyone, even those with little or no accounting experience, can be up and running quickly and easily. Whether your business is just starting out or you've outgrown your current software, features like the ones listed below will give you the insight you need to make informed business decisions. The award-winning Sage BusinessWorks solution simplifies and streamlines key business functions, as well as daily business activities. Make the most informed business decisions possible, thanks to an instant link to critical, up-to-the-minute accounting information. Moving from task to task is easy, and you can access data with a simple keystroke or mouse click. The flexibility and comprehensive functionality of Sage BusinessWorks affords possibilities that were previously unattainable for small businesses. 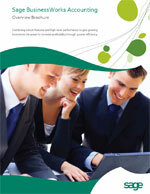 Because Sage BusinessWorks is a real-time system, account balances and cash management reports are always accurate. Beat your competitors to the punch by getting your quote in front of prospects right away. Sending forms by email such as quotes, invoices, and purchase orders saves money, shortens the sales cycle, and helps you close more business. The complete Sage BusinessWorks system includes 11 modules; six core modules: System Manager, General Ledger, Cash Management, Accounts Payable, Accounts Receivable, and Payroll, plus five additional modules: Inventory Control and Purchasing, Order Entry, Job Cost, Custom Office, and the Sage BusinessWorks ACT! Link. You can purchase Sage BusinessWorks and any additional modules you need now, or add any of the additional modules or third-party solutions as you grow. All modules are integrated to work together. Each module offers dynamic features that rival any of you would find in expensive, high-end products. Plus, the system's build-in, multiuser networking capability lets you easily add users as your company grows, enabling them to share data simultaneously. If you are looking for a powerful, yet affordable accounting system that can grow with your business, Sage BusinessWorks is for you.